Use this Royal Icing recipe to decorate your favorite holiday cookies, cakes, etc. Using an electric mixer fitted with the whisk attachment, beat the egg whites, sugar, cream of tartar and salt on medium-low speed until blended. If adding vanilla or lemon juice, add it now. Increase the speed to medium-high and continue beating until stiff peaks form and the mixture is nearly triple in volume, 7 to 8 minutes. Remove the bowl from the mixer, cover tightly with plastic wrap and store at room temperature until ready to use. Icing will stay fresh for 4 to 6 hours. Use a pastry bag with tip for piping royal icing decoration. *Note: Paste food colors will tint Royal Icing the richest, deepest hues. Use a clean wooden pick to dip into color, then into icing. Stir to mix. If the colors start to separate, gently massage the bag to remix the icing. 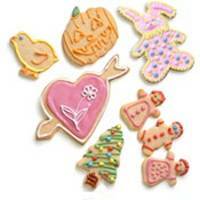 Paste food coloring can be purchased online at: http://www.sugarcraft.com. I used this icing to decorate a cake, it was excellent. I always use vanilla in my icing to get rid of the raw eggs taste. I highly recommend this recipe. A perfect icing, so easy!